Directorate of School Education Kohima Nagaland Recruitment 2019 April - Teacher post:- Welcome to North East India's No. 1 Job Portal NeCareer.com . Today we are back with a new fresh job vacancy in the state of Nagaland. In pursuance of the Govt. Letter NORSE LEGAL 10-95/2018/554 Dated 12-10-2018 and in compliance to the Honorable High Court Order dated 26-07-2018 of WP (C) NO.297 (K).2017, application are invited from Konyak Community for 1 (one) post of Primary Teacher at GHS, Wakching under DEO, Mon in the pay Matrix Level-6. Find more details in below section. Eligibility : The minimum requisite educational will be 10+2/PU Passed with 45% mark having professional qualification of Pre-Service Teacher Education (PSTE). D. EI.ED or Bachelor of Education (B.Ed). Age should not be less than 21 years and not more than 35 years as on 01-02-2019. The upper age limit is relaxable by 5 years for the candidates who are in Govt. Service. Application are to be submitted on plain paper with 2 (two) passport Photo and standard Bio-Data along with photo copy of Educational Qualification documents, Schedule Tribe, Indigenous Inhabitant and Birth Certificate. 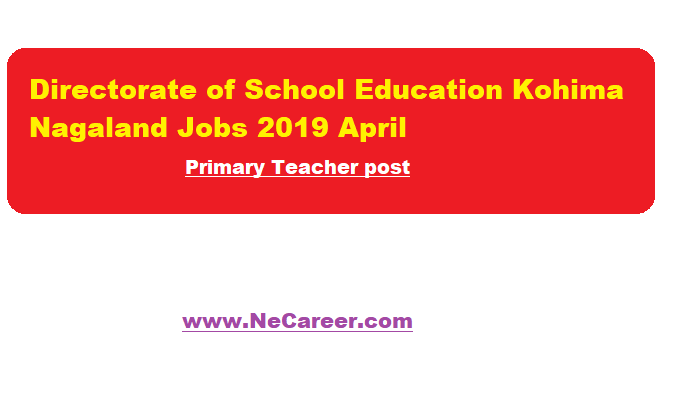 Application should be addressed to Director, School Education Nagaland, Kohima with Rs. 200/- (Rupees two hundred) only in cash or Demand Draft in favour of Director School Education, Nagaland, Kohima as processing fee. The last date of documents for application shall be 12-04-2019.